Open : 18:00pm-23:00pm. Tuesday Closed. ***Delivery Fee for Playa Blanca 2.99 €. Open : 18:00pm-23:00pm. Tuesday Closed. .
Takeaway Lanzarote - Restaurants Playa Blanca Octopus’ carpaccio. Takeaway Lanzarote - Restaurants Playa Blanca Avocado and shrimps salad. Takeaway Lanzarote - Restaurants Playa Blanca Mozarella, tomato and basil salad. Takeaway Lanzarote - Restaurants Playa Blanca Mixed salad with peppers , nuts, cherry tomatoes, goat cheese and raisins. 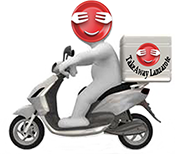 Takeaway Lanzarote - Restaurants Playa Blanca Backed eggplant, tomato sauce and parmesan cheese. Takeaway Lanzarote - Restaurants Playa Blanca Spaghetti with garlic and hot oil. Takeaway Lanzarote - Restaurants Playa Blanca Pasta with garlic and hot tomato sauce. Takeaway Lanzarote - Restaurants Playa Blanca Pasta with olives, anchovies, capers, garlic, tomato sauce and red hot pepper. Takeaway Lanzarote - Restaurants Playa Blanca Pasta with bacon, onions, tomato sauce. Takeaway Lanzarote - Restaurants Playa Blanca Pizza bread with fresh tomatoes , basil , olives , garlic and oregano. Takeaway Lanzarote - Restaurants Playa Blanca Pasta with bolognese sauce.